Coldstream Wedding Car Hire – What a stunning wedding! 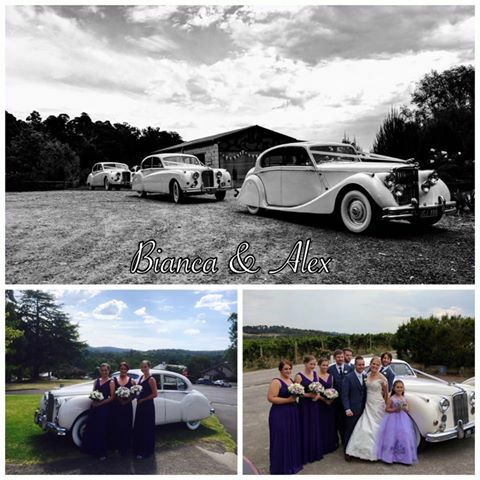 The team at JC Jags had the absolute pleasure of escorting Bianca and Alex to their beautiful wedding ceremony at St Brigid’s in Healesville, and then to their reception at Vines Helen’s Hill in Coldstream. The happy couple and bridal party looked amazing, the amazing colours popping with our classic white jaguar wedding cars as a backdrop. One look at these photos attests to how great these jaguar wedding cars are for perfect pictures! We wish Bianca and Alex all the best for a bright and happy future, and thank them for choosing JC Jags for their jaguar wedding car hire. A happy, smooth and safe wedding day is our first priority! With a larger bridal party, Bianca and Alex made the ultimate statement in style with three of our classic wedding cars! JC Jags have a number of cars to choose from, each a stunning complement to your special day. The Jaguar Mark 7 was first unveiled at the 1950 Motor Show, and combines sleek modern lines with the high level of Jaguar opulence. Our Jaguar MK5 sedan, upon release was one of the finest cars of its class in the world. The style of the Jaguar Mark Five has made it one of Australia’s most popular classic wedding cars. It has a vintage look even though it is a much newer car. Both models of car have a crisp white exterior, traditional polished walnut dashboard, white wall tyres and sunroof. All of our classic luxury cars are fully restored and car hire includes a chauffeur who will go the extra mile to make your day extra special! Contact JC Jags for your Coldstream wedding car hire, and bring some Jaguar brilliance to your big day!